GPRS Project Managers were able to locate the top matt of rebar that was present in the slab on both sides of the wall. The conduit was tough to detect at first as there was so much steel in the wall. 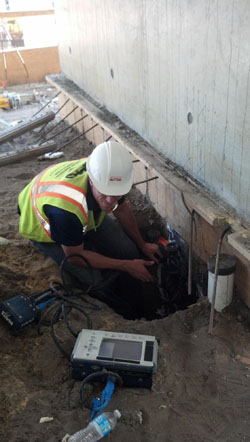 After changing a few settings on the GPR equipment we were able to make out PVC conduit within the wall. When located by radar, each rebar and conduit was marked out on the surface of the concrete with a pencil or marker. Having the ability to identify where critical conduit, cables and reinforcing steel exist in cement slabs can save much time, money and resources, providing a tremendous advantage. The equipment used during the scan was a hand-held, cart carrying a 1600 MHz antenna capable of identifying objects at a depth of approximately 18"- 24" (2 feet) deep. In the pictures to the right you can see GPRS Project Manager, Kyle Kearcher scanning for rebar and conduit in the foundation of the new facility where holes will be drilled. Due to the compact size and mobility of the cart that carries the antenna, Kyle was able to perform GPR below grade after digging a whole to get more data. If you would like a price or quote for a slab on grade, elevated slab, or structural scan to locate important embedments, please visit the “contact us” page at www.gp-radar.com to contact your local GPRS representative.